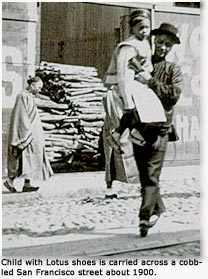 This cruel practice lasted from the tenth century to 1911, when it was banned by the new Chinese republic. The ancient Chinese custom of foot binding has caused severe life-long disability for many millions of elderly women, even in todays China, according to a UC San Francisco study published in the October issue of the American Journal of Public Health published this week. The UCSF study, part of a larger study of osteoporosis in China, is the first to look at the prevalence and consequences of foot binding, according to lead author Steven R. Cummings, MD, UCSF professor of medicine and epidemiology and biostatistics. UCSF researchers examined a randomly selected sample of 193 women in Beijing (93 at 80 years or older and 100 between 70 and 79 years). They found 38 percent of women in the 80s age group and 18 percent of those in the 70s age group had bound foot deformities. The study shows that women in the 80 years or older group with bound feet were more likely to have fallen during the previous year than women with normal feet (38 percent vs. 19 percent) and were less able to rise from a chair without assistance (43 percent vs. 26 percent). We also found that women with deformed feet were far less able to squat, an ability that is particularly important to toileting and other daily activities in China, Cummings says. In addition, the study found that women with bound feet had 5.1 percent lower hip bone density and 4.7 percent lower spine bone density than women with normal feet, putting them at greater risk of suffering hip or spine fractures. Despite the difficulties we observed, women with bound feet did not have greater difficulty preparing meals, walking or climbing steps, Cummings says, adding that these women may have accommodated to their impairments or may be reluctant to complain. The practice of foot binding began in the Sung dynasty (960-976 BC), reportedly to imitate an imperial concubine who was required to dance with her feet bound. By the 12th century, the practice was widespread and more severe  girls feet were bound so tightly and early in life that they were unable to dance and had difficulty walking. By the time a girl turned three years old, all her toes but the first were broken, and her feet were bound tightly with cloth strips to keep her feet from growing larger than 10 cm, about 3.9 inches. The practice would cause the soles of feet to bend in extreme concavity. Co-authors of the UCSF study are Xu Ling, MD, MPH, from Peking Union Medical College, Beijing, China, and Katie Stone, MA, UCSF Department of Epidemiology and Biostatistics. The Chinese Xinhua News Agency announced, in 1998, that the last factory to manufacture shoes for bound-feet women in Harbin, China, had ended production. BEIJING (Oct. 26) XINHUA  Elderly Chinese women whose feet were bound since childhood to keep them small have fewer shoes to choose from in Harbin, the capital of northeast Chinas Heilongjiang Province, because shoe factories no longer produce them, according to a report of Wenhui Bao. 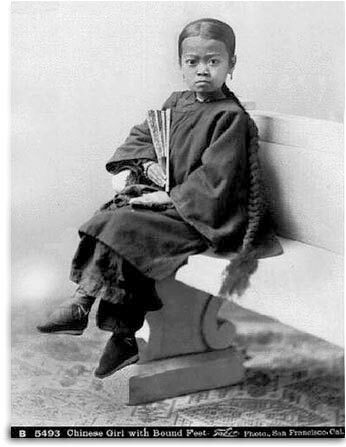 In the past, Chinese womens feet were bound with meters of cloth to stop them from growing so that they would resemble a three-inch golden lotus at a time when normal big feet were considered alien to feudal virtues. The practice originated in the palace of the last king of the Latter Tang Dynasty (923-936 AD) and continued even when it was banned by the Manchuria who established the Qing Dynasty (1644-1911). In remote mountainous areas, women still had their feet bound even when the New China was founded in 1949. The last shoe factory to cease mass production of such shoes in Harbin was the Zhiqiang Shoe Factory. It announced on October 20 that it will make the shoes only on a special-order basis. The factory added small shoes for old women to its product range in 1991 to fill a gap in the shoe market, which was gluttered with high-heel shoes for normal feet. In the first two years, more than 2,000 pairs of the shoes were sold annually, but now the factory has to think of what to do with the stockpile of tiny pointed shoes, which are not even suitable for babies. The head of the factory, Du Guanghua, says that hes already preparing to stop making the shoes in the near future and that he will donate his shoe trees to museums at that time. Photograph by Isiah W. Taber, San Francisco.